: 7/10: Kind of ominous but that's really it. : 7/10: I like the new look but his pose seems to be more intimidating than heroic. : 5/10: Every time I see this one I feel like he's groping his sword. 8/10: a simple pose that completely nails the character. I really like it. 10/10: easily Mario's best render, pose wise. It's Mario's signature jumping animation, how could you go wrong with it? 4/10: easily Mario's worst render. What the heck is this karate-like pose? 5.5/10: I dislike this pose too. I generally don't like when Smash portrays Mario as this angry fighter. The fireball makes Mario even more aggressive and was totally unnecessary. 7/10: this render is... awkward. It's fine but not very DK-ish. 6/10: not a big fan of this render either. It's once again too weird and not faithful to DK. 8/10: there we go! This render highlights DK's muscle and strength, two traits he will often boast about. A bit too angry for my taste, but we get those. 7.5/10: where is DK going? He seems in a hurry. I kinda like this pose, but I preferred the one from Brawl. 5.5/10: not going to lie, even the 2D style doesn't save this pose (and I love the 2D style they used in Smash 64). It's just too basic. 8/10: how do we improve from the previous render? We make Link stepping forward. Cool. They created a great render in just one simple step (pun intended). This render has Link way readier for the fight. 5/10: Smash 64 remastered. But in 3D. 2/10: WHAT?!? Why did they make Link jump in his official render? It's like the one thing he never did before Breath of the Wild! It also looks really bad on the amiibo. 7/10: references Super Metroid's artwork. It's good. 7/10: still references Super Metroid's artwork. It's still good. Has virtually no difference from the one from Smash 64. 7.5/10: slightly better. It's more battle ready without being too dynamic either. 8.5/10: great render. It's perfect with her Other M suit. I like how it looks like she's coming out from a save point. 8/10: the only thing I would have liked more is Samus's design from Metroid: Samus Returns. A bulkier suit would have looked better with this pose. 3/10: good Lord what did they do to you? This... isn't Yoshi. no rank. I hate Yoshi's model from Melee. It's the worst in all of Smash. I can't rank Yoshi's Melee render properly. 9/10: it's so cute and charming! I love how he walks away but still looks at the camera. 8/10: it's in between Brawl and Smash 4. I like it less than Smash 4 just because he used to walk away and I found it more charming. 8/10: hi Kirby, how are you? It's simple and effective, I love it. 7.9/10: nearly identical to 64's, but I like it a very tad bit less. Maybe it's the proportions? Or the 3D style? I don't know. 11/10: Kirby sitting and resting is the cutest thing I've ever seen in a video-game console. 10/10: I will admit it, I love Kirby's Ultimate render despite its "dynamicity". How a Pink Puffball can make me change my opinions so quickly. 2/10: it's bad. It's weird. I don't like it. 6.5/10: it's decent, I guess. I can't appreciate Fox too much, sorry. 7.5/10: one of Fox's best render. I like the expression. 4/10: it's awkward. And he's going to dab. I don't like it. 8.5/10: it's brilliant. How do you make a good Fox render? Simply put him like he's going to shoot! I'm surprised they never made a render where Fox contacts the base with his headgear. 9/10: we already have a great one. I love the smart yet cute expression. 4/10: I thought I liked fat Pikachu until I saw this render. 5/10: not too bad, but very awkward. What is it doing with the front legs? 6/10: it's too basic. Pikachu is standing like it was saying: "Come here, bro." 8.5/10: I want to carry this Pikachu with me for the rest of my life. Also, did you know that Pikachu Libre is a girl? 8/10: not gonna lie, I really like this artwork and in my opinion nails the character. He's goofy and is like: "What am I doing here?" 8/10: hilarious. A bad render but really funny. 8/10: despite all three renders being very different, I like them equally. This one nails Luigi's character as well, being calm. I love Luigi's rolled pants legs too. 1/10: terrible. What is this? 4/10: it's very funny and all, but why? Luigi is no weirdo, Luigi is shy, Luigi is fearful, but not a weirdo. I'm afraid Sakurai sees him as such, and the last two renders confirm it. 8/10: rosy cheeks, a baseball bat and a small child. How could you go wrong with it? 6/10: I'm not completely sure I understand what he's doing. 5/10: remember when I said I dislike when renders are too dynamic? This is the exact opposite. This render is too static to be enjoyable. 8/10: the way he's pointing is cute. I like it. 9/10: Ness's best render. I like the confident pose and the baseball bat. It's a pity they never did a pose with the yo-yo. 8/10: I gotta say it: the 2D style fit Falcon better than anyone else. Maybe it's just because I love superhero comic books. A side note: this is the coolest stock icon in the series IMO. 7/10: quite weird, can't lie. But fits the character. 9/10: the signature military salute. It took them too many years to realize it is a good pose. 6/10: why do they do this? They do a good render then they do a weird one. This kick is nowhere to be found in Falcon's moveset! = = 2/10: I'm not gonna bother ranking the same render three times. This is just straight up lazy. And so I'm going to be lazy as well. 7.5/10: despite being similar to the first three renders, I think I like this one a bit more than Smash 4's. It must be the fact that Jigglypuff is tilted compared to the floor. It makes the character even goofier. For tonight I'm done, but I'm going to continue soon with Melee's veterans and the ones from Brawl done so far. A nice change-up from his previous render and a nice contrast to most other renders. Instead of being dynamic, Ike stands tall and solid as a rock. Vertical lines all around give him this sense of height and strength that makes him really intimidating. Unfortunately, I don't quite love this as it makes it seem even moreso like Ike is on the slower side of things. Nice addition of the cape swirling a bit more. A great show of personality in RD Ike though. Huge fan of this one. Ike's finally using the Ragnell one handed, his signature stance. The diagonal way he holds the sword really adds interesting movement together with the swirling cape, dividing the area above and beneath the sword. The outstretched arm really gives a sense that he's in control of the entire Ragnell, even with only one arm. Together, it really captures how he's got strength to spare and the agility to use it well. Also, interesting to note that there's a large amount of subtle changes with the costumes despite being statistically the same. RD's eyes are sharper, less naive while his face has grown more rugged and chiseled. His only returning costume elements, his headband and cape, are noticeably worn down, with the capes' tatters extending further and the headband itself being more muted. Really shows how the stoicism in Ike has changed throughout the years. A bizarre choice to use the spot-dodge animation, but IMO, very well done. ^ That's honestly how I felt. I see many people hate on Ike's new render, but it's the only one that felt super accurate to Ike as a character in my eyes. Going from his PoR to RD skin.. you can tell Ike has seen some **** between those days. I just overall really like it. Well, well, well, we start our Pokemon Trainer marathon (we'll be on these guys for a bit) with the water squirting turtle. I'm going to give fair warning right now, the Brawl renders for these guys are sort of "eh" at best. The idea was their renders would be all in conjunction with each other, minimizing how average each one looked when grouped together. Squirtle here only looks okay. He almost looks like he's imitating Bowser's Brawl render... but doing it poorly because he's not nearly as intimidating. But... is he smiling or angry? 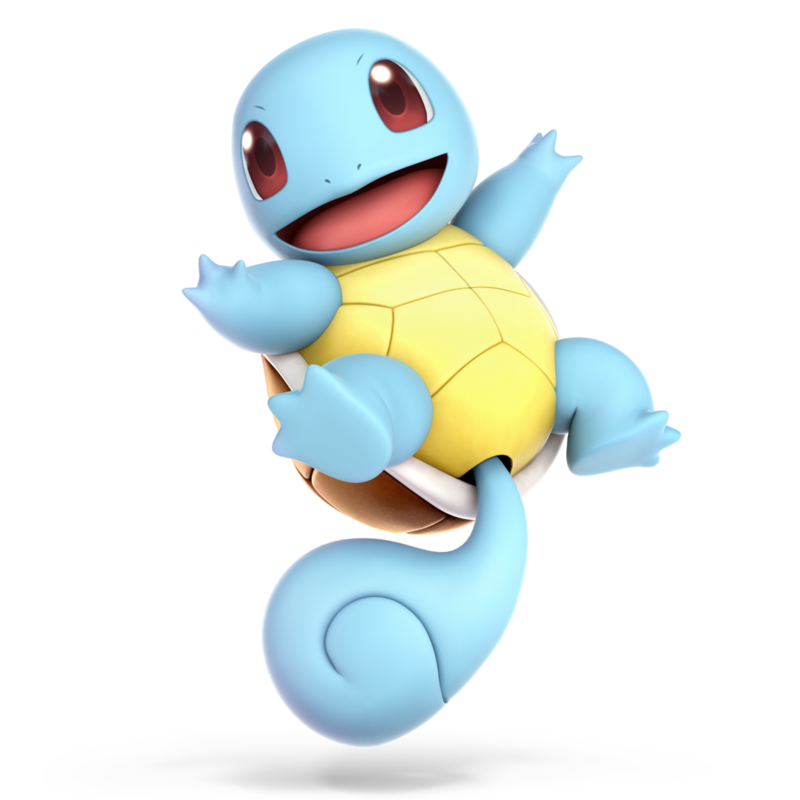 Now that's a jolly good render of Squirtle if I've ever seen one! He's so happy and bouncy (ironic for a turtle, no?) and he looks like he's having fun! This render puts a smile on my face, because the sheer joy is contagious to me. 7.5/10: I really like Peach, so to me, 7.5/10 is a low score. However, the pose seems kinda off to me. I don't know, maybe it's the placing of the hands. 8.5/10: a very good render that nails the character to the point. I like the static yet elegant pose of the hands and the mild expression. 9/10: a more dynamic approach to Peach. I love this render too, more than any other one seen before. The only thing that prevents it to get the perfect score is the face. It has something... off... I don't know how to describe. 10/10: perfection. I think Peach's render in Ultimate may be the best in the game and one of, if not the best, in the entire series. Everything is great: the pose, the expression, the dress, the parasol. It's a dynamic render but still greatly shows the character. I could go on and on. 3/10: gross. What is this? Godzilla? Why are all the colors so weird? And should those short arms remind me of a t-rex? Because to me, t-rex are just weird dinosaurs with very, very short and underwhelming arms. 7/10: I like this render way more. But here we have a problem with the character itself. Sakurai envisions Bowser as a beast, not in line with the current Mario games and I like the latter representation more than Sakurai's. So it does a great job representing Bowser as a beast, but... I don't like it. 7/10: I give this render the same score as the previous one because I think that this one's colors are much better and more in line with Bowser, but I still prefer Brawl's pose and expression. 5.5/10: I don't like this render. It's just too savage to me. Just look at Bowser's spirits and you'll get why I dislike this render. 5/10: the Climbers are too far away from each other, making the duo more like a sum of two individuals. That's what they should avoid when rendering Nana and Popo. 8/10: cool (pun intended)! They coupled Nana and Popo so that they appear as a true duo. They're focusing on the same target. The only thing off in how Nana holds the hammer because it makes it hard to see which color will she use. 7.5/10: this is a good render, make no mistake, but the two Climbers are too far away from each other. That's why I like Brawl's render a bit more. 7/10: I kinda like this render, but it greatly shows why I don't love dynamic renders: they make it hard to see your character. Luckily, you'll never get to see this render in the CSS. 6.5/10: Sheik does this weird sidestep. It looks like she's dancing. I don't like this render too much because, again, it's too dynamic. Plus, the positioning of her arms makes it really hard to see the character. 6/10: why do they always put Sheik's arms in a weird way? They got it right with Greninja (spoiler alert)! Jokes aside, the same critics seen in the previous point apply here. But somehow I like this render less. 8.5/10: this is a great render! The right arm is in this weird position, but it doesn't cover her whole body. In addition to this, Sheik's new design is great, I really like it! She even got one of her best player's signature piece of clothing! 8.5/10: look, I know that the render is supposed to be a reference to a moment in OoT, but simply the fact that she doesn't face the camera pisses me off. But after all, she's a princess, she can do it. So that's why I like the render so much. It has everything right about Zelda (from OoT, at least, the best is yet to come). 9/10: holy moly. TP had the best designs for both Zelda and Ganondorf IMO. This render represents Zelda's royalty greatly and elegantly. Unlike for her alternate persona, the arms are the best part here. Particularly, the positioning of the hands. 10/10: where do I begin with? Take the previous entry and multiply everything you read x10. There's virtually nothing wrong with this render. Also, should I be concerned, because my favorite renders are the princesses' ones? 6.5/10: I hate Zelda's redesign for Ultimate. Did we need a second Peach? AND I LOVE PEACH! But Zelda used to be stern. Now she's just... a bimbo. And the render even fails to represent it. 4/10: good lord Mario, calm down! This render is kinda scary: how angry is Doc? After all, it's not my fault if I'm ill. And in the US, this is a good chance to get some money, right? This render represents neither a doctor nor Mario. For tonight I'm done. It's getting late and tomorrow I have a Math test, so I'd better rest. #1 Basic. I'd like if his head was turned a bit, though. #2 Again, overcomplicated poses in Ultimate. Is he trying to grab a ledge? Is he trying to be Spoink? #1 I didn't really like this pose at first but it's grown on me. #2 Pretty boring, but nails her personality. #3 Like the parasol, but I don't like how spread her dress is. At all. #4 I guess they tried to make her look elegant, but all I see is cockiness. The ugly dress also takes points off. #1 Really like the battle damage colour scheme. Adds to his evilness shown in this render. #2 Just like Peach's SSB4 render, this one has grown on me. The brightened colors look good, too. #3 He looks like an idiot. I guess they tried to make him look savage, but they completely failed. #4 He just......looks to the side. Points of for the anorexia, too. Let's finish the Melee veterans, shall we? 8/10: very cute, I love how he looks very similar to Pikachu's render in Ultimate. The way it spreads its arms like it was trying to hug me is lovely. 9/10: even cuter than Melee's render! First of all, I want to acknowledge Pichu as the "forgotten" veteran I wanted the most. When they ask me why I show them this render (and I give out other reasonings about breeding in Pokémon). It looks like it was spinning with its foot, how adorable. 9.5/10: a fantastic render. Take everything I said about Falco's render in Melee except for the weird hand and multiply it by 50 times. That cocky smile, those smug crossed arms, and the solid overall frame make for a fantastic render. 3/10: what were they thinking? Really, this is no improvement from the previous one. Where do I even begin with? The arms? The legs? Everything about this render is weird, to say the least. 7/10: it's a basic render. It's solid. Says almost nothing about the character, but it's good enough. 7.5/10: lately, a common theme has been the fact that I dislike how they position a character's arms. And this holds true this time around as well. The worst part is the way Marth holds the Falchion. It seems unnatural to me. 6/10: this a very low score for one of my favorite characters, but the way he's holding his sword and his shield... They look off to me. We get to barely see the edge of the Kokiri Sword and the Deku Shield covers too much of his body. Not bad, but certainly not good either. 8/10: another character I was really glad they added back. This pose reminds me of the ending of the Spin Attack. That's a nice reference, but I don't really love this render either. 4.5/10: look, I know the story. But this Ganondorf is definitely based on his OoT appearance. So why in the holy name of moly did they give him the sword? OoT is the only game in which Ganondorf DOESN'T USE A SWORD! The render itself is pretty solid, but the sword REALLY pisses me off. 9/10: a definite improvement. Both in positioning and in style. I love TP designs for Ganondorf and Zelda. They look incredible. The face and the arm make me think of a real villain when I see this render. Great job! 6/10: oh. Ocarina of Time. Definitely didn't expect that. But what is he doing with those hands? Is he buying an apple? I will admit it, though, the red cape is nice. 5.99/10: good Lord how bad has this render aged. I think that maybe due to the "realistic" style Melee's graphics aged much worse than most GC games (take Super Mario Sunshine or The Wind Waker as examples). Actually, the pose itself isn't that bad. It's EVIL enough. The fingers are weird, though. 8/10: that's great. It's Melee render! But done right! Both with the model and with the camera angle itself. It's polished. I like this render. 7.5/10: somehow, I like Mewtwo's Ultimate model less than its Smash 4 one. I feel like this pose is also less representative of the character, despite being much clearer to see. That's why it gets just 0.5 points less than Smash 4. 6.5/10: it's a very basic render. I have no other word. 6/10: they didn't make the same render twice in a row, right? Well, they did it three times for Jiggs... I honestly didn't like that they made Roy this heavy and armored. I prefer his design in Melee. 2/10: one of the weakest renders in Ultimate, at least to me. Why did they opt for a pose as weirdly specific as his side tilt? Why not up air or down smash at this point! I think that with Ultimate they tried to create dYnAmIc renders for everyone, but I'm afraid the sometimes failed... And Roy is a glaring example. Overall: <<< < (side note: I think that, by far, Roy had the worst renders in the series). = 7/10: well. For a character that is essentially an amalgamation of short mini-games, they did more than enough. I rated those renders together because they're the exact same. I will say I like G&W's Melee stock icon more though. 7.5/10: I appreciate the effort. They did a "unique" render of G&W. But it's not that interesting. 3/10: really, the flagman? Now? In Ultimate? Where everything they said about G&W was that he changes model in order to replicate the sprite that appeared in the original games? Welp, I finished Melee. That's good because Melee's models were pretty bad. Oh, don't worry for Lucina. She's coming alongside the other Echo Fighters in a separate post (yup, I'm going to do even Ultimate newcomers). See you later! We have our standard render here for Ivy. It's not much, pretty static, though I like how it's position. It doesn't do a great job of showing the back legs, though it's still clearly quadrupedal. It does fall in line with all the art of Ivysaur up to this point. What I don't like is those weird, dark creases around the eyes. Like who did your makeup, Ivysaur? Ganondorf? It doesn't work with a non-villain character (not to mention it doesn't even have that in all its other portrayals). That's a bright, colorful, expressive Ivysaur! Also, love the presence of the vines in the render. The render itself is super dynamic, it almost resembles Ivysaur's "handstand" taunt. I like how cartoonish it looks though, a great style for the mon. Also, I just realized the nails on the legs in the Brawl render look real nasty compared to the nails in this render, and I mean nasty in the not-good way. I also like that it's mouth is open in the render, more diverse in expression as opposed to "super serious I'm in Brawl" face. What do you guys think of Ivy's renders? I understand that some do not like the realistic looks, but this does not look bad. It gives me a Pikmin/Forest vibe, and I like it. The bulb is quite well done in my opinion. The leaves also have a nice shade to them. I do have a few gripes. It does not really stand out, and the dark blue splotches do not go well with the aqua skin reflecting light. It looked pretty good for Smash Bros, though. Much better overall. It has a more pop-out and cartoony look, and I appreciate that. The dark blue splotches fit quite well now, and I like how Ivysaur is showing the vines. The bulb also looks nice and more elegant which I appreciate. Both are good, but I prefer Brawl. I like the fact that he has his vine whips out, but because he goes on all fours, putting him in the air just looks wrong. I got an idea for a Bonus Round since he is all over today. We should do one for Reggie. And here we have Charizard! 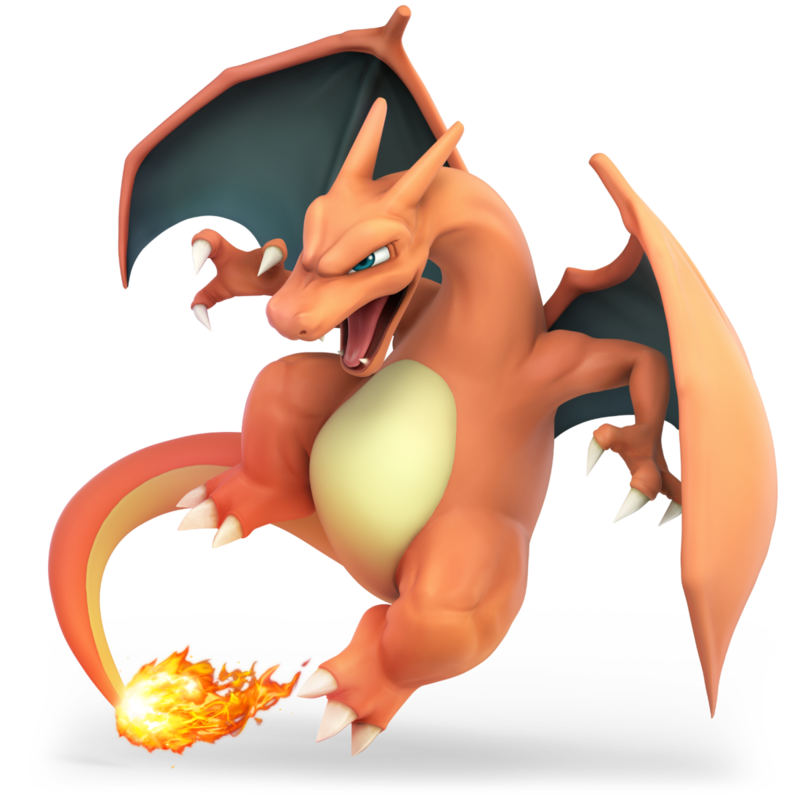 It's funny, Charizard technically appeared in both 64 and Melee as a Pokeball Pokemon: setting the precedent for future characters hoping to get upgraded from assist types (which two of them did, hooray!) but for now let's look at how he appeared in Brawl. So far, it's pretty standard. Not super dynamic, but again this was supposed to be for a group photo. It's pretty static, not sense of movement, he's just posing for the camera. It's not bad, but doesn't really stand out either. And here we have a slightly better version of the render we just saw. 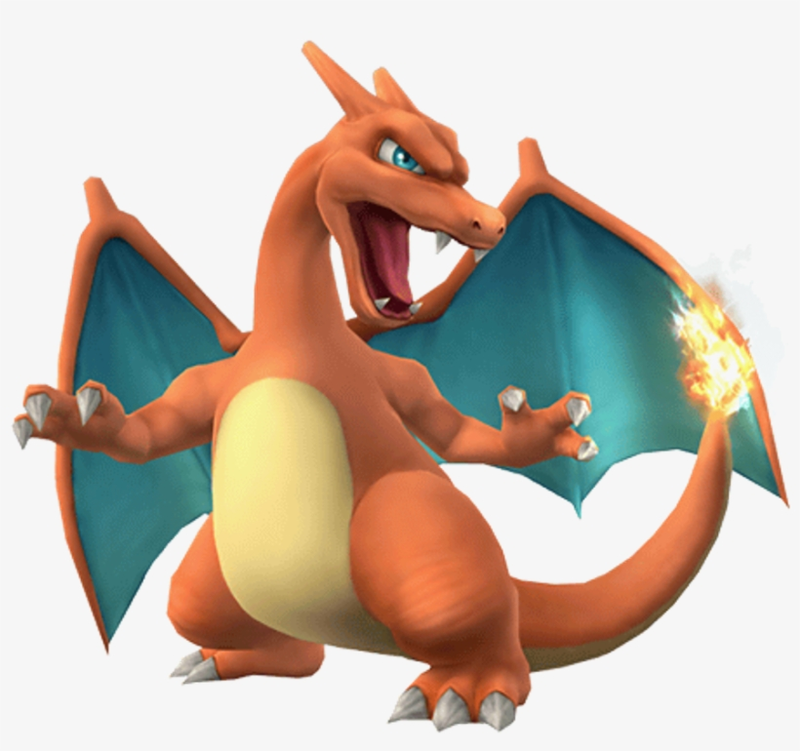 Jokes on Squirrel and Ivysaur, though; at least Charizard got into Sm4sh. 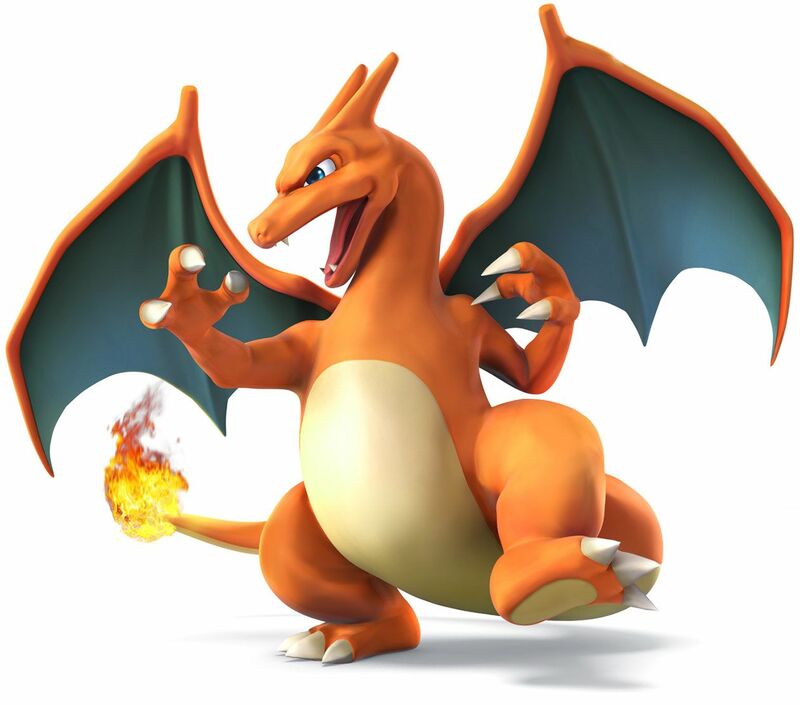 However, it's unclear as to what Charizard is supposed to be doing in this render. It's got a leg up, a couple slightly clenched claws, but the neck looks like it hurts a bit. The left wing is identical to Brawl somehow, but the right wing is out more. It's more dynamic, but I wish it were more interesting. These renders haven't been as nobel or majestic and 'zard's renders tend to make it look, nor is it flying or looking angry/fierce. Where's the power? There's none of that for the standalone Pokemon. It's a little less direct than I'd have preferred, but this is a big improvement over the last two renders in my eyes. Looking pretty pissed, Charizard seems just about ready to swoop down and bite someone's head off. Look at that predator gaze; It sees its next victim! The only touch I would've LOVED to see here is either fire or steam being emitted from the mouth like Ash's Charizard did. Other details to note: look at those leg muscles! The curvature of the tail and neck is nice too! Overall, pretty great, especially when lined along with the other trainer members in Ultimate. Which render did you prefer? I prefer Ultimate Charizard, he's the best he's looked so far. The other two renders look a bit derpy. None of Charizard's renders are bad. I like Brawl the most, where he's just roaring, then Smash 4, where he stomps the ground(and because it's grown on me), and then Ultimate, props for using his wings. : I think this render fits Charizard the best, it has that Dragon look while still retaining that cartoon style that it should have. : The colors on this render are probably my favorite they really pop, but Charizard looks far to clumsy. : There isn't anything I can say about this one I just don't like it. Let's go on with the Brawl veterans, shall we? 7.5/10: MK is a character I have some trouble rating just because he is so weird: he hails from the Kirby series and yet he is so dark and dramatic. I think that this render achieves the result of representing well MK by just adding the wind effect. However, it's a little too basic, at least to me. 8.5/10: those wings are incredible. I love them. This render is dynamic but in the best way possible. It isn't too dynamic and yet it conveys the idea of movement and speed. Oh, and it's quite menacing as well! 8/10: to me, it's a direct improvement from the Brawl one. They exaggerated the wind effect and made MK more dynamic but I like it. It makes him more ready for the fight. 8.5/10: this is actually a great render! Maybe it's because they built Pit's personality on his Brawl persona, but I feel like this render greatly conveys Pit's character. He's slightly smiling, boasting a battle-ready stance and yet he's not too serious. Great job! 9/10: I could totally see Pit in this pose right before an important fight, like against Medusa or Hades. You can say Pit's landing, but he may also be ready to fly again. He's serious and concerned and maybe, and just maybe, if he smiled I would have given this render a hot 10/10. 6.5/10: don't get me wrong. This render ain't bad. It's just... awkward. Why is Pit posing in this way? As a side note, I've always liked Palutena's Bow as a complete bow rather than to separate blades, to this render has this flaw too. 7.5/10: is it just me or did they give Sheik and ZSS, the two "transformation" characters, very similar renders in Brawl? However, ZSS's version is much more polished and lacks the weird arm-thingy Sheik is doing. It's an overall solid render. 7/10: it's an ok render. I don't really like the positioning of the legs and how her face is turned. 8.5/10: that's a nice render! I love the overall positioning of ZSS: it looks like she's been spotted and she's retaliating. It's great: it's quite dynamic but not too much and any of her limbs is in a weird pose (something Ultimate's render tend to do often). 7/10: Wario's pose is quite standard, but it does the job pretty well. It conveys Wario's personality pretty well. It's solid. 2/10: what's Wario doing? Is he flexing? Is he jumping? Is he uncomfortable? All these questions show how bad this render really is. 9.5/10: one of the best renders in the series. They got everything right. The dynamicity, the double "W" sign, the huge mouth and the grin. Ever since I saw it, I loved it. 2/10: Snake stands there. He does look pretty bad and unreliable. I really dislike this one and his face looks like the one of a low-level criminal. 7.5/10: a great improvement and yet they could do something more. There's not a lot to say (paradoxically I think that we can spend more time on a 5 rather than on a 7), but I like the way he's turned. But why is he trying to measure his heartbeats? 8/10: a solid render. You can tell you will play with a burly swordsman. The only thing I don't really like is the fact that he holds Ragnell with two hands. 9/10: Ike's huge in this render. He's still. He means no joke. You'll get no sympathy from him. 5/10: why does he look like a dancer? Why do they have to take one step forward (with Smash 4) and then 4 steps back? And I want the name of the GODDAMN PERSON THAT LOVES TO WEIRDLY POSITION LIMBS. Seriously, the left-hand doesn't work at all! 6/10: it's basic. It's decent. It's not great, taken alone, but you should look at it with the three Pokémon. That way he would look better (I think). 8/10: neat! They used a very simple yet effective improvement: the pointing hand. He has a determined expression that goes really well with the character, even though Pokémon Trainers are known for their abysmal personality. 8.5/10: I think I like Leaf a little more than Red though. She is so cute and happy I can't resist her. Actually, I can. I never pick Leaf, as she uses weird colors for the Pokémon. But as for the trainer herself, Leaf is stellar! 7/10: despite its very basic appearance, I like this render. 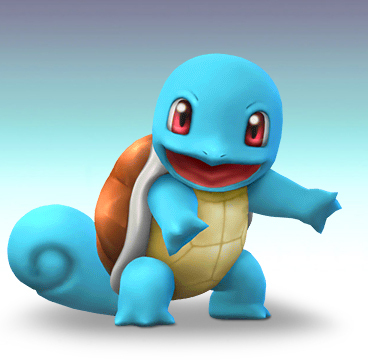 Squirtle looks cute and kinda happy. I also like how it's trying to do its best impression of Bowser: a huge menacing turtle and a cute little one. 5.5/10: Squirtle is doing this weird leap: how is it positioning its legs and arms? It's also weirdly turned. I have to admit I like the color more than in Brawl though. 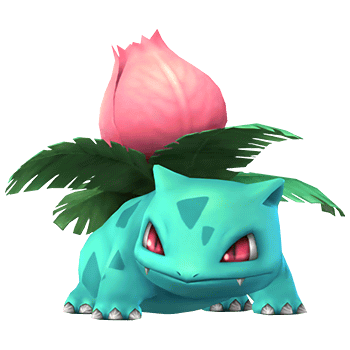 7.5/10: it's very similar to Squirtle's render, but I like this one slightly more because, at least to me, it looks like Ivysaur's Gen 1 artwork. I'm a huge fan of Ivysaur so maybe I'm slightly biased. But it's solid and still. 4/10: why in the holy name of God is Ivysaur leaping in this weird way? I have to say that I like the whips. Without them, it would have probably been a harsh 2.5. 5/10: the worst part of this render is the huge head of Charizard. Other than that, it's pretty basic, much like the rest of the PT team renders. But the huge head is a big drawback. 7.5/10: Brawl's render done right. As a bonus point, they made Zard stomping. It's good. 9/10: COOL! I'm no Charizard fan, but this render is great and makes me wonder why isn't Charizard a Dragon-type Pokémon. It's aggressive. It's flying towards its victim looking for an opening. I like the beastly vibes this render gives to me. He wants to be the very best, like no one ever was, to catch them is his real test, but to train them is his cause. That's right, it's time for the POKEMON TRAINER BONUS ROUND!! Starting off with a pretty decent trainer pose, though I feel the classic one from the original games probably would've been fine too. You know, the one where the brim of his cap partially covers his face? Too cool for school, muh boy. Regardless, this ain't half bad for a ten-going-on-15 year old trainer. Look at the perfect upside-down V in the negative space between his legs. That's amazing. The fist pump is great too. Holy smokes, how dynamic is the trainer supposed to get here? Well, the pose has definitely gotten sharper in his time away from Smash. We must've experienced the part where he left his Charizard alone (in Sm4sh) to train and then went off to continue his adventure for several more seasons before Ultimate-ly coming back to reclaim his Charizard. Overall, a great render that accurately depicts a trainer issuing commands mid-battle. You didn't really think we'd forget this alternate costume, did you? Well too bad, we're doing it! 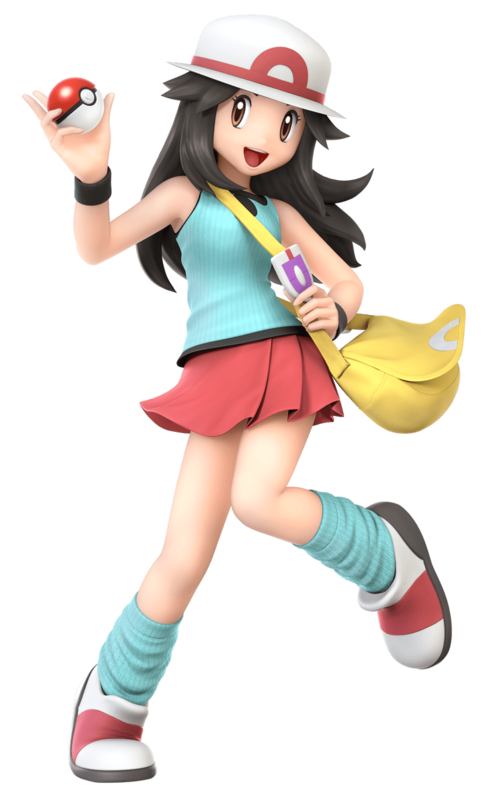 OK, so fun fact: this is the best Pokemon Trainer render. I don't think anyone will argue with me on this either. The fact that it's the female trainer? Automatic bonus points. I mean, seriously; just look at her socks! Those are some amazing freaking socks, I tell ya. And the bend on her right foot? Splendid posing! I also like how stereotypically girly her traits are: legs kept close together, standing on one leg thing, hair flowing in the wind. Do I need to continue explaining? Overall, some pretty good renders in my opinion. They definitely stand out a bit more than the actual images of these characters in their home franchise. What do you guys think of these renders? Do they catch your attention? Or do they merely make you white out? I really dislike that they didn't update the trainers to Sun and Moon. Anyways, I prefer Ultimate female, then Brawl, then Ultimate male. I like the style of Brawl better, in Ultimate they hardly even have noses. One of the few characters that doesn't have "serious brawlitis." Pretty whimsical for a first render, so not bad. Great silhouette, that's for certain. Arms and legs out, happy expression on the face, curvy tail: it all checks out. Good start for DK's little buddy. 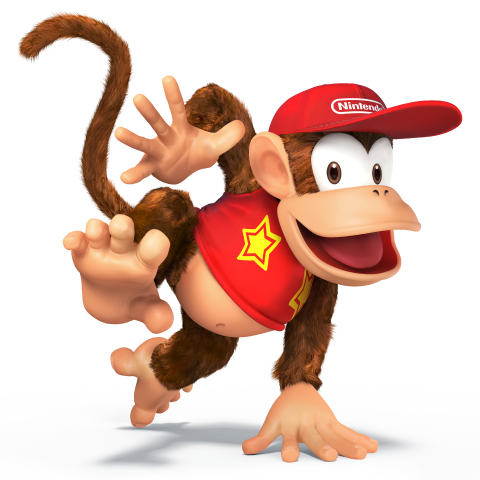 I actually like this render a whole bunch for Diddy. It's very monkey-like, it has a crap-ton more whimsy than the last one, and really dynamic. Also, he's looking at the camera, which is fantastic too. Also, gotta note that the "Nintendo" on his hat is fully visible. Ultimate also follows-up with a very nice render. It's actually incredible the quality this render holds. Hilariously, it looks like the second step in a dance, where the Brawl render is the first step. It's pretty good and looks super clean. 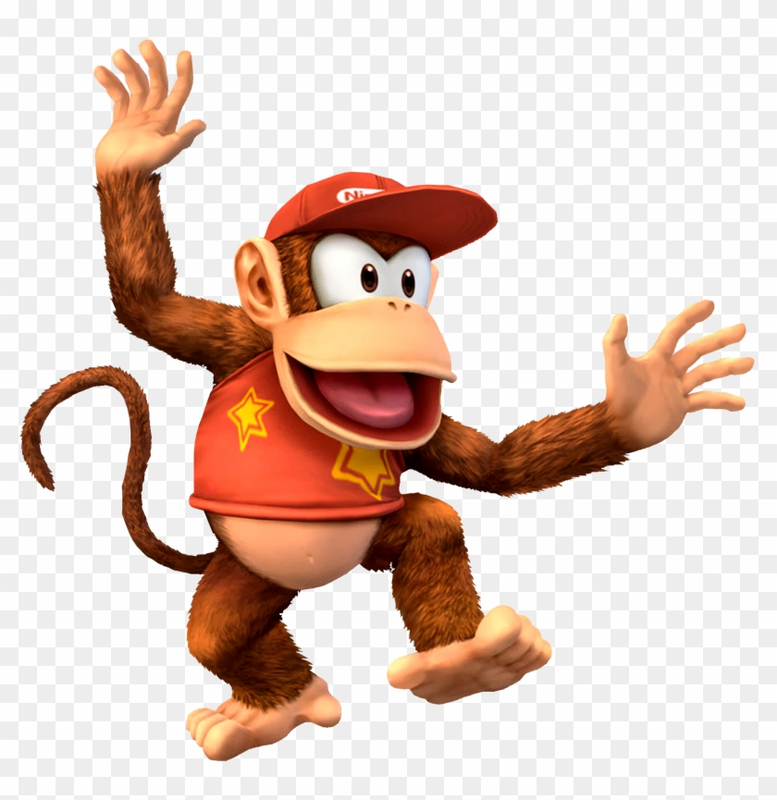 What do you guys think of the little kong's renders? #1 This one has grown on me and I feel it fits him the best. #2 Not the best, but one of his taunts so I give it points. Despite my burning hatred for this character, i have to admit that his renders are really charming.